I feel I should start this month reminding you how to winter-proof your garden rather than giving spring gardening tips! 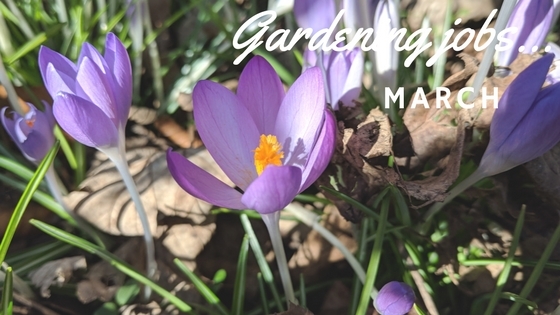 At the end of the month is the start of the Easter weekend when traditionally the gardening season starts. If you can't get outside yet there's still plenty you can start doing in the warm. Sow – It's still too cold for most crops to be sown directly into the soil but you can start many seeds undercover or in a propagator now: aubergines, basil, Brussels sprouts, cauliflowers, celeriac, celery, chilli and sweet peppers, cucumbers, gherkins, tomatoes. If your ground isn't frozen then root crops such as carrots, parsnips and turnips can be sown in the soil. Prune winter flowering shrubs – Cut off any dead wood first and then look for crossing branches. The smallest of these branches should be cut off. As a general rule inward growing branches should also be cut off. Give your lawn some care – This winter's weather will have given your lawn a bashing. Once the snow has thawed wait for your lawn to dry out. If you start walking on it when wet you will do more damage. Remove any leaves and branches. A good rake should remove any moss and dead grass (leave in place for birds to use as next material). If you can give the lawn its first trim before adding any grass seed. Dead head daffodils – If you want a good display next help your daffodils by cutting off dead flowers. This means the plant saves energy by not having to produce a seed head and this energy can go back into the plant for next year. Visit a garden – Many gardens are starting to reopen now for the season. Pick a National Garden Scheme garden open for charity as part of their Daffodil Gardens. Has your garden been covered with snow? Have your gardening plans been put on hold?